Plot: A retired FBI agent is pulled back into the game of taking out bad guys when he meets a girl in a lot of trouble. 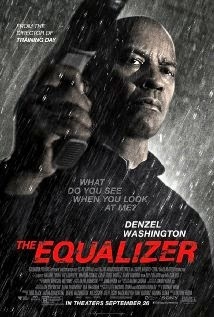 Denzel does it again with another well done performance in a movie that is predictable, but still highly entertaining. His understated demeanor and his ability to portray a tough calm while dealing with high-stress situations make this movie much better than it would have been with a lesser actor. The film is a bit slow in places, but it doesn't bog down too much. The compelling nature of the story and the characters keep the audience interested even in the down times. My only real beef with this movie is the climactic scene, in which we see the big showdown between Denzel and the bad guys. It's like a grown up, killer version of HOME ALONE. And the death scene for one of the main bad guys reminded me of Paul Reuben's death scene in BUFFY THE VAMPIRE SLAYER. That aside, this is a fun flick that will have you cheering for Denzel from start to finish.